March 8th 2007, the literary sky fell in Cameroon. Bate Besong; Kwasen Gwangwa’a, Hilarious Ambe, and their driver were crushed in a ghastly accident on the Douala-Yaoundé highway. Yes, after writing poetry, crying, making and receiving frantic calls from and to Cameroon, it was clear that I had to go to the land of my birth to see for myself and be a witness not only to the dramatic exit of the memorable Obasinjom warrior, playwright, poet, scholar, and social critic, Dr. Bate Besong , but also to witness the exit of the other two literary gurus, Television Producer, Thomas Kwasen Gwangwa’a and Dr. Hilarious Ambe who died alongside BB. I left the United States on the 14th of March 2007 and arrived the next day in Douala at night. After having a restless sleep, I left for Yaoundé the following morning, March 16th, and arrived just in time for the viewing of victim number one, Thomas Kwasen Gwangwa’a. After the funeral rites in Yaounde, I joined family and friends that night for another tedious five hour plus trip to Bali, Northwest Cameroon, for the burial. From Gwangwa’a’s burial, I rushed to Bafut on the same day to witness the burial of victim number 2, Hilarious Ambe and the next day, I was back on the road to Yaoundé to prepare for my descent, and then ascent to Buea to be a witness to the traumatic funeral ceremony of the now legendary Bate Besong. March 21st 2007 was the D day. The crowd at the mortuary was over two thousand including both friends and foe. Buea had not seen anything like that. BB had been such a public figure that he had become more of a symbol than a real person. But his death proved that he was just human, born of woman. And true, BB’s mother was at the mortuary. I stared at her for sometime wondering: how does a woman raise a child who becomes a symbol of hope for a people? When does she realize that such a child will carry the burden of his people? How does a mother mourn a child who symbolized the anger of a people? How does a mother’s personal grief negotiate the boundaries and margins of this show of public grief? White havens, sweet-shawled in loin chambers. I pondered this poem in my mind as I gazed at the woman, whose husband I had flown all the way to come and mourn. What role did she play in the several volumes of plays and collections of poetry that he produced? From what I knew of BB, I figured, Christina must have been the earth to which BB planted his feet, so he could hold steady his pen. I looked at his children. Although his daughters were his scribes, it is in the naming of his male children that BB revealed his mind, from the oldest named Dante through his middle son, Mandela to his youngest son, Eldridge. Thus in-between the foremost Renaissance poet, Dante Alighieri, the revolutionary freedom fighter, Nelson Mandela to Eldridge Cleaver, the Black Panther activist writer, Bate Besong had forged his own identity, an identity which garnered him disciples as well as detractors. 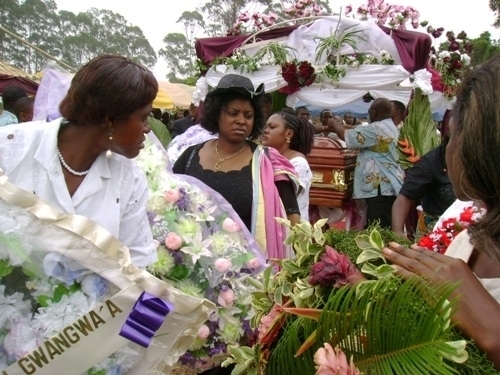 As my mind surveyed BB’s family at the mortuary I realized that I will leave Cameroon with more questions than answers. So by the time the convoy moved to the University of Buea for academic honors, my brain, mind and soul were playing ping-pong trying to decipher who in fact was BB in his totality. My flight was that same day, so after presenting my eulogy to the mammoth crowd that had overflowed the Amphitheatre 750 at the University, I bowed in respect and awe in front of the casket carrying the remains of the enigmatic Obasinjom warrior. Yes I had flown to Cameroon for my grief to find succor but as I entered the car that was on standby to rush me to the airport, it was very clear that I came, I saw but did not conquer…and I now know why…BB’s job is not yet done…his death is just another foundation for the builders left behind…aluta continua! I arrived at UB in mid-March of 2007 as a Fulbrighter in the English department, to find the main writer I wanted to meet recently departed and the whole campus bereaved. I regret never meeting BB but I have learned so much about him from you and his Buea colleagues. Thanks for reposting this thoughtful tribute to a great African writer. So soothing reading from you! We will continue to remember! I have read a little about Bate Bisong but heard a lot of him from elder brothers and sisters prior to 2007. As a final year high school student in 2007 , one of the things that urged me to nurse intention to enroll in the uiversity of Buea was to one day see BB with my eyes. Unfortunately for me, BB journeyed beyond even before i could sit in for the advance level examination. Bate Bisong, a symbol of the university of buea in my little world in those days, i still study at UB there after with one assurance :That is, to commune with the famous BB as i move around the campus and classrooms where he has taught. BB you lives on: Great writer. Ah! His spirit remains alive, especially during this season of carnage on our part of the world!